This calm and relaxing game doesn’t expect a lot from you, but it does offer a relaxing and serene experience. Does it strike a balance between relaxation and engagement, or will this world put you to sleep? Read on to find out. The core mechanic in Shape of the World involves exploring the world to bring it to live. Your surroundings are a blank canvas until you begin walking forward. As you do, trees sprout up around you, rocks emerge from the ground, and all manner of creatures burst forth. Watching the world procedurally build itself around you as you move is quite the spectacle that really never gets old, even after several hours of wandering in the game’s environments. There’s a sense of awe and mystery as you soar through these surreal landscapes and bring forth detail and life with nothing more than your footsteps. To progress in Shape of the World, you’ll need to look out for triangle-shaped gateways that shift the color palette or propel you into a new environment. Stepping into these is always a treat, especially when you are launched into the air to gaze upon the world beneath you. Simple puzzles emerge in the form of stones that you must activate, but these are very quick distractions. They often produce a staircase that takes you to a new area. When you begin walking on these staircases, you slide forward like you’re on a roller coaster. The mixture of slow walking speed with the smooth movement of the stairs and the interactions with rocks or trees that propel you towards them gives Shape of the World a nice amount of variety in the way you navigate its environments. Much of these discoveries are made through experimentation. When you see your cursor change, you can press R2 to interact with objects, creatures, or stone structures. The results are somewhat varied, so it’s worth checking out how you can interact with the world around you. None of the mechanics are very in-depth, but I suspect that was intentional. 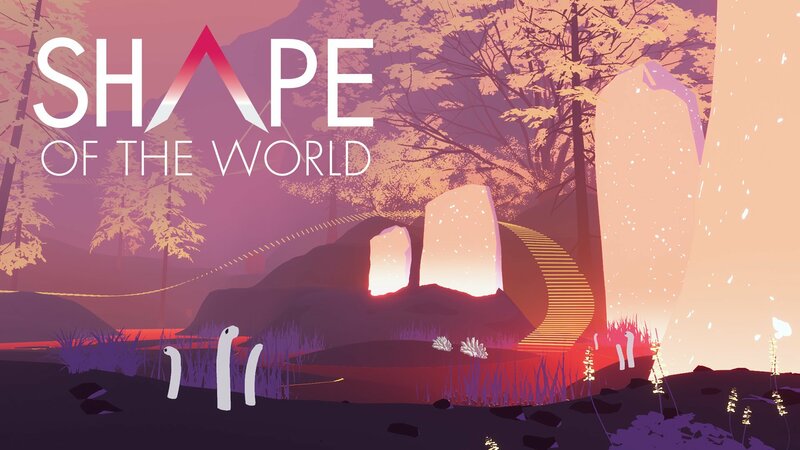 Shape of the World is meant to be a very relaxing, very player-driven experience, and in that regard, it succeeds fairly well. You can also collect various seeds in the world that allow you to throw them and create trees with the L2 button. This is a cool way to interact with the world and provide your own contribution, but it’s another mechanic that is fairly shallow. Shape of the World is very enjoyable in short play sessions, but it doesn’t offer enough compelling reason to explore for longer durations. Additional puzzles or even a narrative of some sort could have gone a long way towards making this world feel deeper than just its visual appeal. It’s very relaxing, and the mechanics at play do encourage a fair amount of exploration, but it’s missing that key ingredient that would elevate it from good to great. As rote as it may sound, I also would have loved to experience this world in VR. It just seems like the perfect way to take in all of these colors and details. Shape of the World is an absolutely gorgeous game. The simple graphics offer hidden details as you move through the world. Whether it’s majestic and beautiful creatures or the leaves of bright trees, I loved the style at play here, and I think it would have been amazing in PlayStation VR, had that been an option. Like a perfect wine pairing, the visuals and the soundtrack here have an excellent harmony. The electronic undertones of the music are perfect for these kinds of visuals. Composer Brent Silk really does a nice job of creating music that responds well to your actions in the world and the pace of the scenery. Whether it’s the calm soothing beats of exploration or the soaring melodies that accompany your trips through the sky, Shape of the World is a treat for the senses in a lot of ways. I would have loved to see a story here that waxes philosophical and the profound, but even without a tale to tie this world together, Shape of the World is a truly serene and relaxing experience that I would recommend to anyone who needs a break from it all.